It's common for businesses in growth mode to struggle with implementing consistent marketing, sales, customer service, and business development processes. 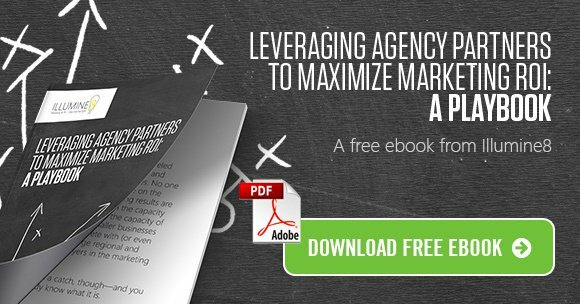 It can seem like only a small fraction of your great marketing and demand generation initiatives get executed. If you're exhausted by your ideas and initiatives going dark, it's time to step into the light. We invest time and care to understand your culture, brand, operations, competitors, and your short and long term goals. We listen, research, and assess thoroughly, building a solid foundation upon which to build your marketing infrastructure. With a strong foundation in place, we create a blueprint for succes and begin to build the design, technical and content materials which are critical for reaching your goals. Together, we defeat failure to launch with skillful, efficient execution. Websites go live, campaigns reach audiences, blogs get read, buttons get clicked, and growth actually starts happening. Your marketing is now generating crazy amounts of data. Lucky for you, at Illumine8 we're all about numbers. We dive intoo the statistics and determine how we can improve results and reallocate dollars to make success a reality.